Jackson County is 50 miles from Asheville, 111 miles from Knoxville, 50 miles from Gatlinburg, and 150 miles from Atlanta, GA. It’s also convenient to Upstate South Carolina, and less than three hours from North Carolina’s largest city, Charlotte. 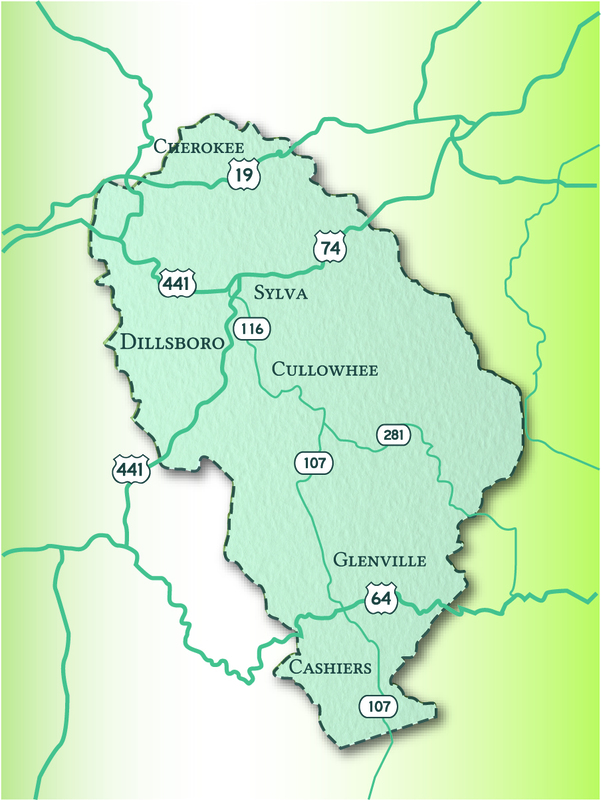 With a 22% increase in population over the past decade, economic growth has been steady and consistent in the county and its townships in Sylva, Cullowhee, Forest Hills, Dillsboro, and Cashiers. Jackson County and its municipal and educational partners are committed to encouraging business and industry development in a variety of ways. Regional and local resources are also available to provide financial assistance to qualified businesses and entrepreneurs. Quality infrastructure in Jackson County includes the Jackson County Airport located one mile from Cullowhee (FAA LID: 24A) at an elevation of 2,856 feet. Tuckaseigee Water and Sewer Authority; Duke Energy; Blue Ridge Southern Railroad; Great Smoky Mountains Railroad; and three primary highways, the Great Smoky Mountain Expressway, North Carolina State Highway 107, and U.S. Highway 64. In a state with one of the lowest overall costs of doing business, Jackson County’s current tax rate of $0.28 per $100 valuation is one of the lowest in the state. Jackson County’s sales tax rate is 6.75%, 4.75% of which is state sales tax. Our state’s construction costs, electric rates, overall taxes and cost-of-living indices are all below the national average, and we have the lowest unionization rate in the nation. You can learn more about the North Carolina market and how Jackson County compares favorably with other North Carolina counties at ThriveNC, the North Carolina Department of Commerce website.